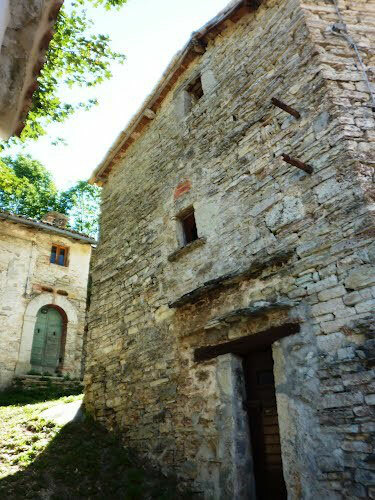 In "Walking in the Sibillini", Tamara Griffith talks of Bolognola, a village situated in the mountains at about 1,400 metres above sea level, and it's alternative to Nutella....! The arrival of ‘Nutella’ in Bolognola was like a social revolution for youngsters. Previously the eating of sweets was determined by religious celebrations and festivals, and was not part of the daily diet............. Likewise it’s easy to understand why people might imagine a better life was in store when ‘Nutella’ arrived, and hence be quick to discard the past. Yet before Nutella, Bolognola had its own special sweet which was apparently similar in taste and made from pigs' blood.This was quintessential to Bolognola, and deserves explanation.When a pig was slaughtered the blood was always collected, and then poured through a cotton cloth to strain any lumps. The strained blood was put in a pot, and grated orange peel, raisins, cinnamon, and sugar was added.The amounts, and the exact seasoning varied in each family. The blood was then cooked, stirring constantly. The resulting mixture was thick like a pudding and dark coloured. It could be spread on bread like Nutella, eaten warm as a pudding, or stored for up to three months and sliced. Locals say nothing, but nothing, tastes better than this! Personally, I'll stick with the Nutella we know today.